Lesile was born in 1915 in the Wang Wauk area in the Wallamba district near Taree in New South Wales. He became well known in the circles of football, tennis and cricket, in 1939 the then family moved to Beerwah in Queensland and took up woodchopping and soon went on to become one of Queenland and Australia’s most distinguished axemen. He was married to Irene and had four children, Joyce, Oriel, John and Athol. 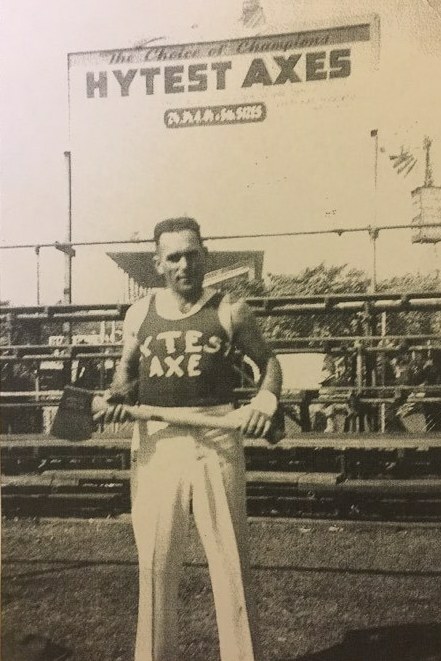 In 1951 he became the most successful axeman at the Sydney Royal Easter Show and was presented with his trophy by the then Miss Australia, Miss Margaret Hughs. His success continued and again winning the 15 in underhand contest in Sydney in the 50s and may more competitions throughout the East Coast of Australia. Some of his opponents in the era included the greats George Parker, Jack O’Toole, Tom Kirk, Leo Appo, Bob Breton and the Lavis and Summers brothers. Les passed away in 1976 and lies at rest and peace in Hughenden Queensland.